Andy leads Ofgem’s work on electricity access and non-residual charging and the teams dealing with emerging issues such as storage, local energy and electric vehicles. He led for Ofgem on the joint Smart Systems and Flexibility Plan with Government and jointly chairs the Ofgem-BEIS Smart Systems Forum. Andy is also a member of Ofgem’s Enforcement Oversight Board. Previously, he was Associate Partner in our networks divisions leading at various times on electricity and gas transmission, and distribution policy and regulation of energy networks generally, and before that Head of Enforcement and Competition Policy. Andy is Vice-chair of the CEER (European Regulators) Distribution Systems Working Group, Chair of the CEER Smart Grids Co-ordination Task Force, and a member of the Bureau of the OECD Network of Economic Regulators. 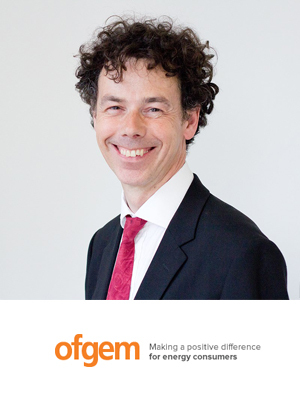 He joined Ofgem in 2008 from the Office of Rail Regulation (ORR), where he was Head of Network Regulation, and interim Deputy Director of Industry Monitoring and Analysis. Andy had previously held a number of posts at ORR, including leading on European Policy, developing ORR’s strategy and corporate planning, and managing regulatory oversight of commercial access contracts for rail infrastructure.